Until very recently I had never read a Jane Austen novel. I know that is a shameful confession for a supposed English bookworm to admit to, but it's true. Of course I've watched all the BBC adaptations over the years (Colin Firth in breeches on horse back; whats not to love? ), but somehow never got round to reading the good lady herself. So knowing Jo Baker's novel was heading my way I borrowed a copy of Pride and Prejudice from the local library. It was of course brilliant but I'm not even going to attempt to critique a novel that people have made careers of analysing. 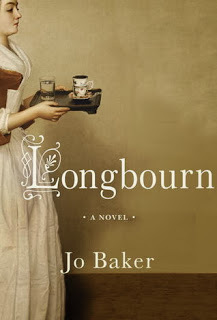 It did however give me an appreciation of how brave Jo Baker was in her literary ambition to attempt to write a piece of Austen 'fanfic' (apparently that's the term for writing a prequel or sequel to another authors work). Not only is Austen's work fiercely guarded by legions of super-fans who seem to take a personal affront to such homages (and trust me these people are scarily serious types who review books using the royal "we"), but she is brazenly inviting comparisons to be made between her own work and a literary masterpiece. Amazingly Baker pulls it off. Readers hoping to find out more about Elizabeth and Darcy might be disappointed initially as it is quickly apparent that this is very much a story about the people living downstairs in the Bennet household and whilst we are aware of snippets of the Pride and Prejudice plot taking place, these events are very much in the background, almost like a soundtrack to the Longbourn story. But I was soon far too interested in what was happening to Sarah, the housemaid, to care; her life and daily routine was fascinating to read about and I thought Baker managed to strike a delicate balance between the gritty reality of a servant's existence with Sarah's pursuits of her own hopes, dreams and romantic aspirations. Similarly it would have been easy for Sarah to seem either too blind and accepting of the social injustices she was subject to or to be too modern a heroine, fiercely pitting herself against them. She is neither, and when I came to make the inevitable comparisons ultimately for me Sarah made the Bennett girls and their fripperies seem less vital, even Elizabeth, which is quite something. This is a wonderful book which I think Austen virgins, super-fans and everyone in between can enjoy; I loved it.